Please check back here for updates before testing your scripts. Instructions for downloading, installing, and running the script are given below. Note: DS9 version 7+ does not work well with lucichk. Use DS9 v6.2. Download and modify these to suit your needs. Scripts that pass these tests will run at the telescope. The current version now checks for many of basic scripting and observing problems, but it is very difficult to anticipate everything. We also want to retain maximum flexibility to use LUCI in a creative manner to facilitate science. Thus, if the script checker warns you of something you know you did for a good reason, feel free to ignore the warning. If you are not sure why the script checker is responding the way it is, you find any problems or inconsistencies, or if anything is unclear, please contact us (it helps if you attach the script to the email and a description of what you were trying to do)! FLEXURE_COMP should now (Sep 2011) be ON as needed. The version of perl you are running is not critical, but please check the version of ds9 you are running. Some initial development was done under v5.7 and tests on this page were done with v6.1.2. Version 5.6.3 does not seem to work. You can check the version by launching ds9 and clicking the "file" and then "about" buttons. Upgrade ds9 if necessary. Click the link at the top of the page to download and save the file to the directory that contains your scripts. You will be asked to identify what type of script this is. In this case (34Her.acq) it is an acquisition script for a telluric calibration star. Is this an Acquisition, Imaging, Science or Calibration script? There is some overlap between the script types, but generally use acq for all scripts where you are trying to acquire a field for subsequent spectroscopic observations (longslit or mos). 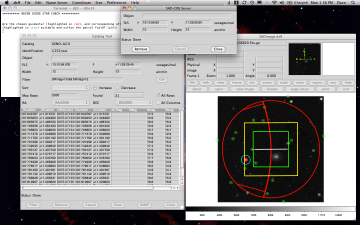 Use img for science imaging scripts or twilight flats (for the most part). Use spec for spectroscopic observations. Use cal for darks or anything that uses the calibration unit (e.g. arcs, spectroscopic flatfields). You can get some odd behavior if you mis-identify the script type. *WARN* Estimated dwell time is less than 60s (20). If you say that the guide star is not suitable, follow the instructions on selecting a new one from the catalog. You may need to zoom in to see the dither positions. Only seem to work with ds9 version 5.7 or newer. Does not seem to work with DS9 version 7+. No time estimate is included for motion of the masks or any additional data obtained by hand during the acquisition sequence. Odd failures traced to presence of "^M" characters. We have little experience working with skycat, but the functionality built into DS9 also exists there. If someone writes the perl code to duplicate what DS9 is used here for (image and catalog download, drawing regions and interactive selection of other guide stars), please send it to the scienceops email list so it can be incorporated into Steve's script.